Radio Frequency Identification (RFID) uses radio frequency to read information stored in a RFID card or tag. 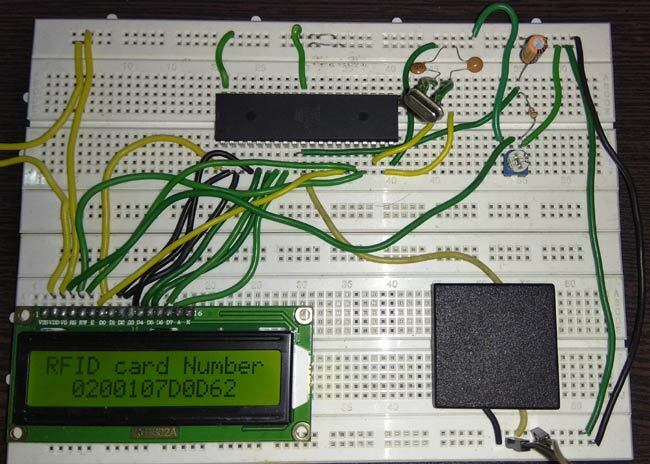 In this project we are going to Interface EM-18 RFID reader with 8051 microcontroller and display RFID card number on 16*2 LCD display. This wireless RF Identification is used in many systems like RFID Based Attendance System, security systems, voting machines etc. This project will also serve as a proper interfacing of 16*2 LCD with 8051 microcontroller. 8051 microcontroller is a 8 bit microcontroller which has 128 bytes of on chip RAM, 4K bytes of on chip ROM, two timers, one serial port and four 8bit ports. 8052 microcontroller is an extension of microcontroller. The table below shows the comparison of 8051 family members. 16*2 LCD is a widely used display for embedded applications. Here is the brief explanation about pins and working of 16*2 LCD display. There are two very important registers inside the LCD. They are data register and command register. Command register is used to send commands such as clear display, cursor at home etc., data register is used to send data which is to be displayed on 16*2 LCD. Below table shows the pin description of 16*2 lcd. The below table shows frequently used LCD command codes. EM-18 RFID reader operates at 125 KHz and it comes with an on-chip antenna and it can be powered with 5V power supply. It provides serial output along with weigand output. The range is around 8-12cm. serial communication parameters are 9600bps, 8 data bits, 1 stop bit. Its applications include Authentication, e-toll road pricing, e-ticketing for public transport, attendance systems etc. Check all the RFID Projects here. 00107D0D = 1080589 in decimal. 62 is XOR value for (02 XOR 00 XOR 10 XOR 7D XOR 0D). Hence number on the card is 0001080589. For 16*2 LCD interfacing with 8051 microcontroller, we have to define pins on which 16*2 lcd is connected to 8051 microcontroller. RS pin of 16*2 lcd is connected to P3.7, RW pin of 16*2 lcd is connected to P3.6 and E pin of 16*2 lcd is connected to P3.5. Data pins are connected to port 1 of 8051 microcontroller. Next we have to define some functions which are used in the program. Delay function is used to create specified time delay. Cmdwrt function is used to send commands to 16*2 lcd display. datawrt function is used to send data to 16*2 lcd display. Rxdata function is used to receive data from serial port. In this part of the code we are going to configure 8051 microcontroller for serial communication. TMOD register is loaded with 0x20 for timer 1, mode 2 (auto reload). SCON register is loaded with 0x50 for 8 data bits, 1 stop bit and receive enabled. TH1 register is loaded with 0xfd for baud rate of 9600 bits per second. TR1=1 is used to start the timer. In this part of the code , we are sending commands to 16*2 lcd. Commands such as clear display , increment cursor , force the cursor to beginning of 1st line are sent to 16*2 lcd display one by one after some some specified time delay. In this part of the code we are receiving the output of the EM-18 RFID reader through serial interface of 8051 microcontroller and stored in a variable. Count is used to keep track of number of bytes received. Once all the 12bytes of data are received, next we have to display it on 16*2 lcd display. This process is repeated forever in order to read different cards. In this part of the code, we are sending commands to 16*2 lcd display. The command is copied to port 1 of 8051 microcontroller. RS is made low for command write. RW is made low for write operation. High to low pulse is applied on enable (E) pin to start command write operation. In this part of the code , we are sending data to 16*2 lcd display. The data is copied to port 1 of 8051 microcontroller. RS is made high for command write . RW is made low for write operation. High to low pulse is applied on enable(E) pin to start data write operation. Also, check our all RFID projects with other microcontrollers. input[count]=rxdata(); //receive serial data and store it. return ch; //return the received data to main function. Good work. Very well explained..
O2- PREAMBLE is same for all rfid cards?